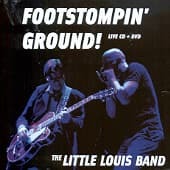 This double disc package captures The Little Louis Band's energetic live performance at Moulin Blues 2008, Holland's biggest blues & roots music festival. With full dedication, they deliver their unique version of the blues, played with a nasty punk-rock attitude. Harmonica, guitar, drums & upright bass take you on a 45 minute roller coaster ride through the raw varieties that blues music has got to offer. Also included is a superb live solo performance by Little Louis, armed with only a guitar, footstomp and vocal cords.